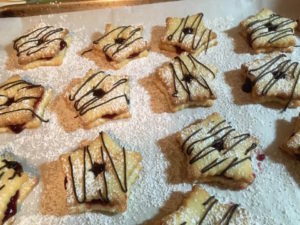 oh, the combination of raspberry jam, buttery biscuits and dark chocolate drizzle. linzer cookies look like they’re difficult to make, but really, they’re simple. you’ll use the same dough for both the top and bottom cookies, with the only difference being the ‘hole’ in the top cookie so you can see that luscious jam oozing through it! i use linzer cookie cutters, but you can easily use a large cookie cutter for the basic cookie, and either a smaller cookie cutter or even a straw, to cut out the ‘centers’ of the top cookies. and if you just choose to make a sandwich cookie, you can skip cutting out the hole in the top cookie! i made these especially for my hubby, who loves a good cookie, is very partial to raspberry flavor and loves his chocolate. i’ll report back on if he thinks these cookies are keepers. check back in the next day or so for ‘the hubby report’! 1. with your electric mixer, cream butter and sugar until light and fluffy. 2. add eggs and almond extract, mixing until well blended. 4. turn dough out onto a lightly floured board, and knead in the remaining 1/4 cup of flour, creating a firm dough. wrap dough in plastic wrap and refrigerate overnight. 5. preheat oven to 350 degrees. prepare your cookie sheets, lining them with parchment paper. 6. roll dough on lightly floured board to 1/8-inch thick. using a cookie cutter (approximately 2″), cut dough into chosen shape (circle, star, etc.) using a 1/2 cookie cutter, cut out the center of half of the original cookies so you have an even number of tops (with holes) and bottoms (without holes). place cookies on parchment-lined cookie sheets. 7. bake for 9-10 minutes, or until edges just begin to brown. 8. remove cookies from the oven and let cool on cookie sheets for about 2 minutes. transfer cookies to wire rack to continue cooling. cool completely before the next step! 9. it’s cookie assembly time! pair cookies of similar size tops and bottoms. dust the bottom layers with a light coating of confectioner’s sugar. using an offset spatula or your butter knife, spread a small amount of jam/preserves onto the bottom cookie. place a top over the jam/preserves and press gently. dust top of cookie very lightly with confectioner’s sugar. 10. melt dark chocolate chips in microwave until smooth. 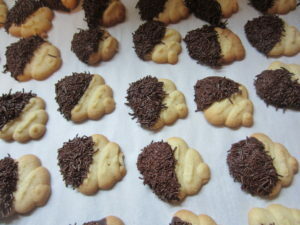 either fill decorating bag with the smallest tip you have, or dip a fork into the melted chocolate, and lightly create thin lines atop your cookies. 11. let the jam and chocolate set for a few hours. a silly name, for sure! 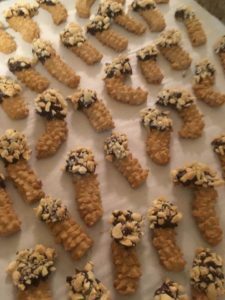 but these little morsels are a yummy peanut butter spritz cookie, fancied up with a dip of dark chocolate and some crushed peanuts. they’re light and tasty, and the peanuty flavor shines through with each bite. you may be tempted to use a chunky peanut butter, but the chunks will make it a bit difficult to go through your cookie press, so opt for the creamy peanut butter. 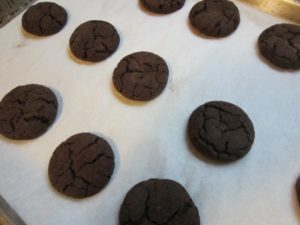 and though they look much prettier and bake more evenly when shaped by the cookie press, you can certainly roll them by hand, cut them, and use a fork to ‘draw’ a decorative texture on them. the other very helpful tool when making this tool is a nut chopper. king arthur flour sells the one i swear by here: https://www.kingarthurflour.com/shop/items/nut-chopper. again, if you don’t have this tool, don’t let that stop you from baking these cookies! place them in a bag or between some parchment paper and smash them with the back of your chef’s knife or a rolling pin! you’ll need a bit more ‘elbow grease’, but the nuts will be just as crushed! if you give this recipe a try, please let me know what you think. happy baking! in a large bowl, cream the butter, peanut butter, granulated sugar and brown sugar, about 4 minutes, until they are well-combined and light and fluffy. add the flour, baking soda, baking powder and salt. on very low speed, begin to mix the dry ingredients into the butter mixture. as dry ingredients get incorporated into the butter mixture, raise the speed to medium on your mixer. be sure your ingredients are thoroughly combined. cover dough and refrigerate overnight. bake for 9 minutes or until golden brown. remove cookies to wire rack to cool. once cooled, prepared to dip! melt your chocolate in the microwave, stirring until smooth. have your crushed peanuts in a separate bowl nearby. dip one end of each cookie into the melted chocolate. immediately dip the chocolate-covered end into the bowl of crushed nuts. place the dipped cookies on a cookie sheet lined with parchment paper, allowing the chocolate and nuts to set/cool. today’s cookie is a perfect addition for the holiday cookie platter. but beware: there are people who just loathe the scent or taste of anise, so be mighty careful who you share this with! yes, i’ll admit, it’s a strong flavor, but in many italian households, the flavor and scent of anisette liquor is as welcome as the fresh smell of espresso brewing or the sunday gravy bubbling away on the stovetop. these anise squares go great with a nice, strong cup of espresso. they also work well as an accompaniment to a bowl of coffee ice cream. or any flavor of ice cream, for that matter. 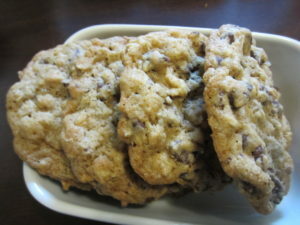 they are easy to make, a cinch to bake, and will fly out of the cookie jar. i cut these out with a wavy square cookie cutter, but don’t hesitate to use whatever cookie cutter you have on hand. or just roll and cut by hand. they’ll taste just as good! i promise! 1. combine butter, sugar, egg, anise and vanilla extracts in a large mixing bowl. 2. beat at medium speed until smooth and creamy. be sure to scrape the bowl down often. 4. preheat oven to 375 degrees. add parchment paper to cookie sheet. 5. roll out dough on lightly floured surface to approximately 1/8″ thickness. use your cookie cutter to cut out desired shape. 6. place cut cookie shape onto your prepared pan. sprinkle liberally with decorative sugar, pressing the sugar into the cookie dough so it will be sure to stick. 7. bake for approximately 6-7 minutes, until cookies are set and edges are lightly browned. 8. remove from oven, and let cookie sheet cool on wire rack for 10 minutes. remove cookies directly to wire rack. store in covered container. i didn’t think it was possible to like a snickerdoodle more than my original recipe, but boy, was i fooled! because these chocolate snickerdoodles elevate a good cookie to a positively great cookie! the cinnamon is still the star flavor attraction, but the deep chocolate flavor seems to provide the perfect upgrade! as for texture, they’ve got a nice crunch, true to form of most snickerdoodles. and the signature crackle that appears atop each cookie really does make for a lovely-looking delectable. lastly, i boxed them up and they made their way down to the pnb crew today, and by all reports, they disappeared in record time. now, i know you’re thinking ‘stagehands! they’ll eat any cookie you put in front of them!’ but that’s not true!! they are quite the cookie connoisseurs! so i’m guessing these will be keepers in my cookie repertoire for the foreseeable future. cream 1 2/3 cups of sugar and the solid shortening until soft, fluffy and light, about two minutes. beat in the eggs, one at a time, until completely incorporated. be sure to scrape your mixer bowl often. beat in the vanilla until well incorporated. add the flour, cocoa powder, baking soda and salt to your mixer bowl, blending on low speed just until the dough begins to form clumps and crumbles. using your hands, knead the dough just a bit more, finishing the dough to come together as a somewhat grainy, but cohesive ball of dough. using your #40 scoop, or a piece of dough the size of a small walnut, roll it into a 1″ ball. then roll the ball in the cinnamon and sugar mixture. place the cinnamon/sugar coated balls onto your parchment-lined cookie sheets, about 1 1/2 inches apart. bake for 13 minutes, then (and here’s the fun part!) remove the cookie sheet and give the cookie sheet a hard ‘rap’ against the oven rack. the continue baking for another 2-3 minutes. the cookies will be slightly cracked, and may feel dry, but will still be soft to the gentle touch. cool on cookie sheet for 3 minutes, then transfer cookies to wire rack to cool. 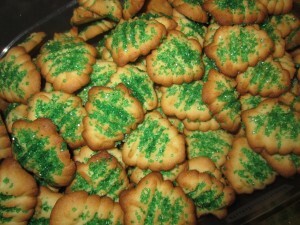 recipes for traditional spritz cookies are strewn all over the internet like confetti at a new year’s eve celebration. 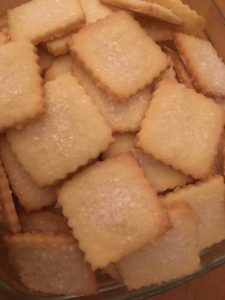 butter, sugar, flour – those three main ingredients make a delicate, tasty spritz cookie, a favorite among children and adults alike. they also look really awesome on your holiday dessert buffet, because though they are easy-peasy to bake, with an easy click-click from the handheld cookie press and a sprinkle of some colorful sugar, you’ve elevated your cookie to both look and taste better! spritz cookies are my favorite. i especially love their buttery flavor, and these don’t disappoint at all! 2. in a large mixing bowl, thoroughly cream together the butter and sugar, for at least two minutes. 3. add egg, egg yolk, vanilla extract, and almond extract to the creamed mixture. mix well. 4. sift together 3 1/2 cups flour and baking powder. 5. gradually add dry flour mixture to the creamed butter mixture, mixing to form a soft, but not sticky, dough. if your dough is sticky, slowly add flour in small amounts until the dough is the right consistency. 7. bake in 400 degree oven for 9-11 minutes, until edges begin to lightly brown. 8. cool on wire rack. enjoy!! i am such a fan of shortbread. it’s certainly easy to bake – a few quick steps and wa-la! cookies! i am also a big fan of espresso. it was a staple in my grandparent’s home. my grandpa drank a demitasse cupful first thing in the morning to ‘get his motor running’. my grandma liked to indulge in an after-dinner espresso spiked with a bit of sambuca or anisette liqueur. and i find the little one-cup espresso pot quite a piece of nostalgia and comfort in my own seattle kitchen. and the aroma? there is really nothing quite like it. so, it’s a natural instinct to join the heavenly scent and taste of espresso with the delicate crumb of a good shortbread. this recipe is not too sweet, not too heavy on the coffee flavor, and just the right amount of buttery java goodness to satisfy most adult cookie lovers. and i’ve added some mini semi-sweet chocolate pieces to add a little extra oomph! delicious and satisfying, these shortbread cookies will pair well with a fresh cup of coffee or even an after-dinner cordial. why not give them a try and let me know what you think! 2. mix all ingredients, except the chocolate pieces, in your mixer bowl on medium speed, until they are well-combined into a firm dough. 3. add the chocolate pieces and gently mix until they are incorporated into the dough. 5. smooth out the top with an offset spatula. 6. bake for 35 minutes, until the edges have begun to brown. 7. remove the pan from oven, placing the pan on a wire rack, and cut the shortbread into desired sizes. let them cool directly in the pan. Offset Spatula: This Ateco Offset Spatula will make it a cinch to spread the dough into your pan. cinnamon has always been a favorite flavor of mine, and i always associate autumn with the spice. since the days are turning a bit brisker, it felt only right to whip out the cinnamon, not only for delicious cookie flavoring, but so my home would have the scent of cinnamon wafting through the air. of course, along with autumn comes the start of holiday panic. 🙂 i’m sure you know it well. social media posts include memes eagerly reminding me ‘only 9 fridays until christmas’ and posts by overachieving friends who’ve already finished all their holiday shopping. seriously?? i’ll let you in on a little secret: i am definitely not one of those overachievers. to be honest, i haven’t even made the lists yet, let alone shopped or created the gifts. 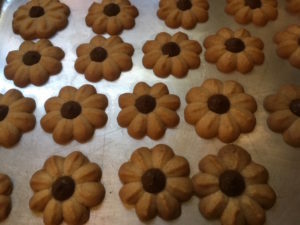 what i have been doing, however, is adding new cookies to my holiday repertoire. because, well, cookies. need i say more? these spritz-like cookies are really a cinch to bake, and they look terrific! they’re also sturdy enough to include in a holiday tray, and i’ve found them to be a real crowd-pleaser! though i use dark chocolate chips for the center of the burst, you can use milk or semi-sweet chocolate, whichever you prefer. 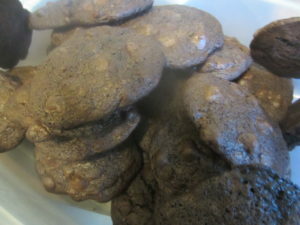 i like the combo of dark chocolate and cinnamon, and i find the typical dark chocolate chips are a little larger/wider than milk or semi-sweet chips, so the dark chocolate ones fit beautifully in the center of these cookies! pretty to look at, and yummy, too! that’s a win-win in my book! 2. combine butter, sugar, egg yolk and vanilla in mixing bowl of stand mixer. 3. beat at medium speed until all items are well-combined and creamy. 4. turn off mixer, and add flour, cinnamon and salt. 5. beat on low speed until well-mixed. 8. bake for 8-10 minutes, until edges are lightly browned. 9. remove from oven and let cookies sheets cool for about 5 minutes before removing the cookies to a wire rack for remaining cooling. oatmeal + chocolate chips = nummy, yummy cookie! i buy a lot of products from king arthur flour‘s catalog. it’s a really good thing that they’re located in vermont, because if they were closer to seattle, i’d be making pilgrimages there weekly. oh, who are we kidding, i’d be there daily. discovering new, ‘must-have’ products on each visit. and though i visit their web site often, i usually just fawn over their delicious looking recipes. i’ve got so many cookbooks and family recipes, that i tend to be overwhelmed by the ‘try this recipe’ pile that sits on my end table – and on my laptop monitor. but i couldn’tresist when king arthur flour said this was the ‘2015 recipe of the year’. who was i to question the wisdom of bakers far savvier and more knowledgeable than me? so, i gave it a go, tweaking a little bit here and there, and decided that this was a pretty amazing cookie! great taste, great texture, and ease of baking – the trinity of the perfect cookie. so, with a few tweaks (changed semisweet chips to dark chocolate chips, as well as upping the amount from 3 cups to 3.5 cups, and added a bit more vanilla), i present to you this award-winning recipe direct from king arthur flour – with a little bit of ‘tweak’ added with love, from me. and as a side note: king arthur flour suggests using these cookies for ice cream sandwiches! awesome idea, if you ask me! i’m on my way to get some ice cream right now! add the vanilla and egg, beating until smooth. add the egg yolk, beating until smooth. in a separate bowl, whisk together flour, oats, baking powder, baking soda and salt. using a tablespoon scoop, scoop the dough onto the prepared baking pans. be sure to leave about 2″ between each cookie mound. bake for 12-16 minutes, until cookies are a light, golden brown with slightly darker edges. the middles may still look shiny, but as with most cookies, they’ll continue to bake when cooling them on their pan. Remove from oven, wait about 4 minutes, then transfer them to a wire rack to cool completely. there’s nothing quite like chocolate, and these cookies serve as quite the perfect pick-me-up on days when you need a little extra motivation! it’s a blustery march day here in seattle, and the wind chimes outside my kitchen window can’t seem to keep up with the non-stop winds. my little kitchen is safe from the crazy blowing, and the heat from the oven, along with the heavenly scent of rich cocoa, are serving to keep me warm and cozy! these cookies are rich and a bit decadent, and just one or two will hold you for a good long time. i included chocolate chips in my recipe today, but feel free to substitute nuts (chopped walnuts work well), or split half chips and half nuts. i promise these cookies, with a tall glass of milk, will brighten anyone’s day. take note, these cookies are soft and chewy when they first come out of the oven, then firm up after a few hours. if you’d like a chewy cookie on day 2, just pop it in the microwave for about 10 seconds, and it’ll be just as soft and chewy as a freshly-baked cookie! preheat oven to 375 degrees. line your cookie sheets with parchment. beat together the butter, sugars, cocoa, salt, baking soda, baking powder and vanilla until creamy and well blended. add the eggs, one at a time, beating until smooth. you’ll need to scrape the sides a bit to be sure the eggs are completely blended into the mixture. add milk, again beating until smooth. add the flour and espresso powder, till well-incorporated into the batter. add in chips and/or nuts. stir until well blended. using your tablespoon scoop (about 4 measuring teaspoonfuls), drop the dough onto your parchment-lined cookie sheets, about 2″ apart. bake cookies for approximately 14 minutes, until they are set and no longer shiny. remove from the oven, let cool on the cookie sheet for about 5 minutes, then transfer cookies to wire rack to complete cooling. oh, the rain continues to fall from the sky here in seattle, and i think we all need a little faux sunshine to chase the blues away. these buttery delights are just the thing to raise some dreary spirits! 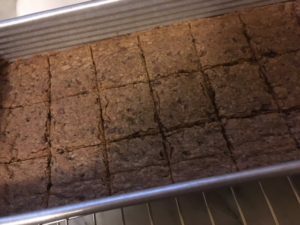 they’re light and tasty, and after they’ve cooled, i simply dip them in a bit of melted dark chocolate and dip in the delicious chocolate sprinkles that i purchase from king arthur flour. they are ‘real’ chocolate, not waxy at all the way some chocolate sprinkles can be. and they are the perfect way to finish off these little bites of perfection! mangia! 1. preheat oven to 350 degrees. there’s no need to butter your cookie sheets or to use parchment if you are using a cookie press. the dough has enough butter in it, and the press will push the dough onto the ungreased surface and adhere nicely. 4. combine the dry ingredients. add to butter mixture until just combined. be careful not to overmix or the cookie will lose its tenderness and be a bit dry. 5. place dough into a cookie press (or a pastry bag) fitted with the shape of your choice. 6. place dough shapes 2″ apart, as they will spread a tiny bit. 7. bake for 13-15 minutes, until the edges begin to become lightly golden brown. 8. remove from oven and let cool on cookie sheet for approximately 5 minutes, before removing the cookies from the sheet and placing on a wire rack to finish cooling. 9. once completely cooled, dip one side of your cookie in melted dark chocolate, and dip into the sprinkles. place back on wire rack to let chocolate harden.